I find I am growing ever fonder of David Felder's music. I first encountered it by accident when I bought the recently-reviewed recording of Morton Feldman's Instruments II and The Viola in My Life IV on EMF. At the time I bought it, I confess to being disappointed that a rare recording of Feldman's orchestral output was not all Feldman, but Felder's music is terrific stuff, music I would be substantially poorer for not knowing. Felder's aesthetic is about as far removed from that of Feldman as can be imagined. In some respects it recalls both the work of Elliott Carter and, oddly enough, Alfred Schnittke, particularly in its reliance on poetic inspiration for what are formidably abstract forms and being very much concerned with traditional notions of rhetoric despite the very aggressive harmonic language. (Felder's work, perhaps mercifully, lacks the great Russian's black humor undercutting the power of his utterance with crude musical jokes, as if to remind us of just how artificial and arbitrary, in the end, all art must be.) While I don't suppose anyone would necessarily consider the music tuneful, Felder's melodic structures recall their distant tonal ancestors. This and his sure sense of rhythmic construction gives the music tremendous forward motion. Beyond that, he as a stunning sense of instrumental color whether in the pieces for full orchestra or the single chamber work heard here. The most immediately accessible work is Six Poems from Neruda's Alturas for large orchestra from 1992-3. The six poems (of twelve) Felder used as inspiration are not reprinted here, a definite blot on the production end of the recording. He deployed them unequally over the works' three movements which fall into a conventional fast-slow-fast sequence. Beyond that, like the other two works here, the piece is actually an extended set of variations on a fragment from another work by Felder. That method of construction, while not in any way audible, at least to my ears, is undoubtedly part of what gives the music its sure continuity. Six Poems..., in the violence of its outer movements and the uneasy calm of the central one can also call to mind another of the twentieth century's great orchestral works, Honneger's Symphonie Liturgique. I have no hesitation in putting the present work in the same class and the performance by the June in Buffalo Festival Orchestra under Magnus Mårtensson is virtuosity personified. Coleccion Nocturna (1982-3) is also inspired by a poem by Neruda. Jan Williams, in his notes to the EMF recording, quoted the composer's description of the poem, powerfully evocative images of a surreal nocturnal landscape, great distance, both physical and spiritual, and a world rich in energy and exhausted isolation. That pretty much gets it right. Scored for clarinets, piano, tape and optional orchestra (recorded in the latter form on the EMF disc), it is a virtuoso work for two extraordinary instrumentalists, something on the order of Peter Maxwell Davies astonishing Hymnos. Again Felder's extravagant sense of instrumental color comes into full play, here abetted by the addition of a four channel tape. This allows him to seduce over a wide range of moods where the harshness of the harmonic language or the extravagance of the playing techniques might seem forbidding but rarely is. Both versions have much to recommend them and they are sufficiently different in effect to necessitate hearing both. 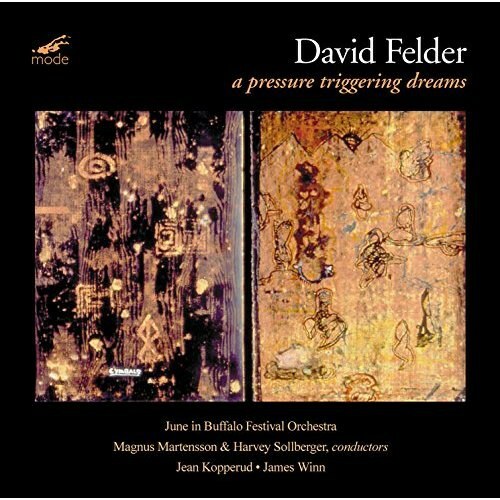 A Pressure Triggering Dreams (1996-7), the title derived from Nietzsche, was written in answer to a commission for a work for orchestra involving electronics. Although written in a single movement, it also follows within the fast-slow-fast framework of the earlier Six Poems... Unlike, say, the use of computer processed sound in the works of composers like Boulez, Nono, or Saariaho, Felder uses his collection of samplers, mostly programmed with flute sounds, more in the manner of Messiaen's use of the ondes martenot, as another color available in his already enormous orchestral palette. Again, the combination of striking orchestral sound combined with the composer's sure sense of musical form carry the listener along sufficiently to bring him or her back a second, a third, a fourth time to discover just what there is here. The orchestral performance, this time under Harvey Sollberger, is again a miracle of brilliantly recorded orchestral color, beautifully capturing the composer's rare rhythmic drive, something notoriously difficult to achieve in music of such complex harmonic construction. This is remarkably rewarding music, tough but ultimately quite accessible to anyone with open ears. I would have preferred reprints of the Neruda poetry with translation to Felder's program note explaining why he is not fond of program notes, but that is the only blot on an outstanding issue. Firmly recommended.